john4jack (Corvallis, Oregon, United States) on 5 April 2009 in Plant & Nature and Portfolio. I love the plum blossoms. Very nice work here, the dynamic range is just amazing as well as the details. The detail captured here is simply incredible, Jack. I could almost reach in and stroke the flower, so delicate and beautifully observed. @EYES WIDE SHUT: Thank you, Paul. Hi Jack, great lighting on these beautiful soft petals, love the textures, and the stamen..... incredible. Great macro. I really love the texture of their petals ! It's beautifully enlighted Jack ! It seems to have a woman's touch. I think it's a flower of love. Exceptionally beautiful and very intriguing. Jack ou are a magician ! Here were magnificent one portrait of flower, romantic and soft ! @alireza: You're macro on March 23 is exquisite. Superverlous. An wonderful creation to behold. Magnificent spring shot.... beautifuls pink. I hope it is as fragrant as it is beautifully captured! @Judy: Actually not; it is the daphne that is truly fragrant. Beautiful ! I love the way the petal are around the heart ,so neat and lovely ! I agree, I've been trying to appreciate the cherry blossom since it's all I hear about here in Japan, but in truth I think I like the plum blossom better! beautiful photo! 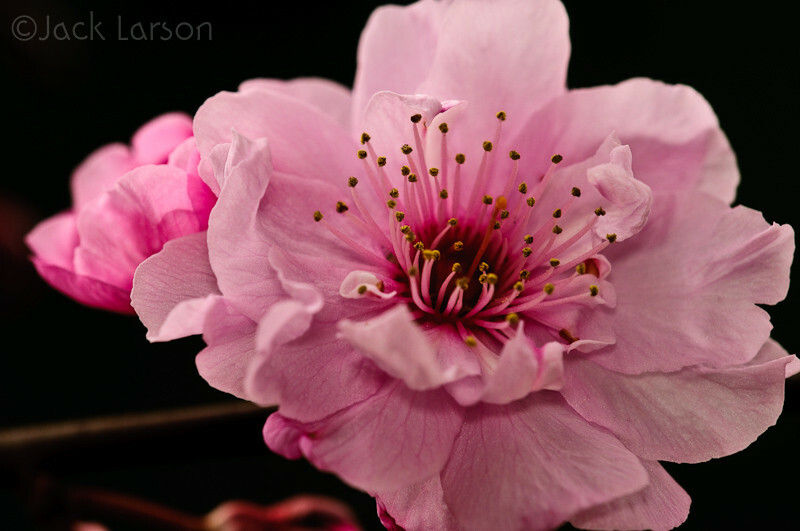 I love Plum Blossoms too now that I have seen your images. Outstanding macro and color. It is an incredible bloom. Stunning, Jack. A gorgeous blossom with all those lovely shades of pinks and near reds. Wonderful detail in the stamen. I like how you left some of the background visible as a setting for the flower. Beautiful image. A lovely pink bloom for a Sunday !! Pretty Pink blossom. LOvely shot. wooow, this is a sensational shot my friend! with this image you take us into the heart and soul of mother nature. @JJ: Now that you admit it, that actually was what I thought was, but that seemed a little too obvious. No guts, no glory. beautiful pink and perfect clarity! The spring in all its beaute excellent!!!!!!!!!!!!! So delicate and beautiful! Lovely close-up, Jack. A wonderful pinky dressed flower , nice details for this picture , have a nice day Jack ! I love it too ;-) Pink Lady ! It is a parade of beautiful colors with this beautiful exposure of flowers. Spectacular detail. Love the DoF. Clarity: Perfect. Plum photo: priceless. Really nice work, mon ami. Beautiful Shot.. love the colour! Incredible composition and color - fantastic - this has so much interest with this flower - just wonderful! Another gorgeous capture of a flower!! How do you make them glow? @Anita: Send them lots of love! Beautiful details and pink flower. what a beautiful flower and your image is so sharp -- very fine detail! Wonderful flower ! Very well done! The flowers you've done over the past few days are all good, but this one is exceptional! I love the depth and the deep background color and the way the little yellow parts (believe it or not I was once a bio major and can't remember what those things are called) stand out. great series of flowers !!! !